Problems with melamine-spiked formula surfaced this fall in China, where unscrupulous manufacturers intentionally dumped it into watered-down milk to falsely elevate protein levels. The concentrations in China were as much as 2,500 parts per million - about 10,000 times greater than what the FDA found in the U.S. The FDA said there have been no reports in the United States of human illness from melamine. The chemical, which legally can be used in product packaging and a solution to clean manufacturing equipment, can bind with other chemicals in urine, potentially causing damaging stones in the kidney or bladder and, in extreme cases, kidney failure. Mead Johnson spokesman Paradossi said he was frustrated that the FDA had provided inaccurate information for worldwide distribution by the AP. He said the FDA informed his company of the test results, as well as the inaccurate disclosures only Wednesday, during an emergency conference call the agency staged with major manufacturers and the industry's trade group. During a similar call Monday, the FDA told the industry about the upcoming AP investigative report. Nestle did not returns calls seeking comment Wednesday. At the same time, Illinois Attorney General Lisa Madigan called on the state's public health department and the FDA to recall both the Nestle and Mead Johnson products - and urged the companies to take that step regardless of what any government agency does. Madigan also criticized the FDA's handling of its test results. The [FDA] apparently withheld the results of its testing from the public for over three weeks, and then only disclosed the information in response to a [Freedom of Information Act] request by The Associated Press. Illinois Attorney General Lisa Madigan"The agency apparently withheld the results of its testing from the public for over three weeks, and then only disclosed the information in response to a FOIA request by The Associated Press," she wrote in a letter to Michael Leavitt, the secretary of the U.S. Department of Health and Human Services, which oversees the FDA. As for possible consideration of a recall, the FDA's Leon said: "The agency would only seek to remove a product on the basis of a risk, based on scientific evidence. That's not what we're talking about here." Consumers Union said that the FDA's assurances are of small comfort to parents and caregivers. "The FDA originally said there was no safe level for these contaminants in infant formula. So this formula is contaminated," said Jean Halloran, the group's director of Food Policy Initiatives. "It is very disturbing to us that no recall has been requested." She urged the FDA "to immediately make public all of the results of its tests for melamine contamination in food," even those with levels below what would trigger agency action." Rep. Bart Stupak, D-Mich., a frequent critic of the FDA, also has called for recalls. During a series of calls with formula manufacturers starting Monday - put together hurriedly, according to several participants, as the AP was preparing to publish its story - the FDA has told manufacturers it has taken 230 samples of various products, including pediatric supplements and ingredients used in infant formula. Leon said that 87 of those samples are of infant formula, and that 77 of those have been analyzed. Nestle's Good Start Supreme Infant Formula with Iron had two positive tests for melamine on one sample, with readings of 0.137 and 0.14 parts per million. 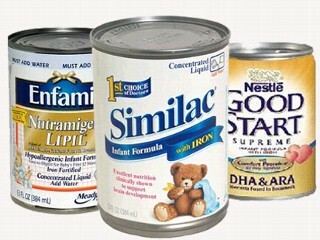 Mead Johnson's Infant Formula Powder, Enfamil LIPIL with Iron had three positive tests for cyanuric acid, at an average of 0.247 parts per million. Separately, a third major formula maker - Abbott Laboratories, whose brands include Similac - told AP that in-house tests had detected trace levels of melamine in its infant formula. Those levels were below what FDA found in the other formulas, an Abbott spokesman said, and below any nation's safety guidelines. WASHINGTON (AP) -- Two months ago, federal food regulators said they were unable to set a safety threshold for the industrial chemical melamine in baby formula. Now, however, they found a way to settle on a standard that allows for higher levels than those found in U.S.-made batches of the product. Food and Drug Administration officials on Friday set a threshold of 1 part per million of melamine in formula, provided a related chemical is not present. They insisted the formulas are safe. The development comes days after The Associated Press reported that FDA tests found traces of melamine in the infant formula of one major U.S. manufacturer and cyanuric acid, a chemical relative, in the formula of a second major maker. The contaminated samples, which both measured at levels below the new standard, were analyzed several weeks ago. The FDA had said in early October it was unable to set a safety contamination level for melamine in infant formula. Dr. Stephen Sundlof, the FDA's director of food safety, said Friday the agency was confident in the 1 part per million level for either of the chemicals alone, even though there have been no new scientific studies since October that would give regulators more safety data. He had no ready explanation for why the level was not set earlier. The standard is the same as the one public health officials have set in Canada and China, but is 20 times higher than the most stringent level in Taiwan. The problem of melamine in infant formula first surfaced in China in September. A scientist for a national consumer group said it was irresponsible of FDA to assure the public that infant formula is safe based on tests of only 74 samples, especially since cyanuric acid is a byproduct of melamine, making it likely that they will be found together. "This is a slippery slope of rationalization by FDA," said Urvashi Rangan, a senior scientist with the Consumers Union in New York. "FDA needs to get a handle on how widespread the problem is and, most important, if both these chemicals are occurring in any products. They just haven't tested enough to know that yet." Earlier this week, members of Congress and the Illinois attorney general demanded a national recall, something FDA said made no sense because it had no evidence suggesting that the formula would be dangerous for babies at the levels of contamination found. After saying it made an error in its data, the FDA on Wednesday produced these results: Mead Johnson's Infant Formula Powder, Enfamil LIPIL with Iron found melamine at levels of 0.137 and 0.14 parts per million. Three tests of Nestle's Good Start Supreme Infant Formula with Iron detected an average of 0.247 parts per million of cyanuric acid. Separately, a third major formula maker - Abbott Laboratories, whose brands include Similac - told AP that in-house tests had detected trace levels of melamine in its infant formula. Those levels were below what FDA found in the other formulas, an Abbott spokesman said, and below any national safety guidelines. The agency had left the impression of a zero tolerance on Oct. 3 when it stated: "FDA is currently unable to establish any level of melamine and melamine-related compounds in infant formula that does not raise public health concerns." The FDA and other experts said they believe the melamine contamination in U.S.-made formula had occurred during the manufacturing process, rather than intentionally. The U.S. government quietly began testing domestically produced infant formula in September, soon after problems with melamine-spiked formula surfaced in China. Melamine can legally be used in some food packaging, and can rub off into food from there. It's also part of a cleaning solution used on some food processing equipment. Pritchard reported from Los Angeles.